Course Description: This course covers advanced algebra topics including: linear equations, matrices, absolute value, inequalities, factoring, parabolas, quadratics, complex numbers, exponents, polynomials, functions, composite functions, inverse functions, rational expressions, conic sections, probability mechanics, algebraic and geometric sequences and series and basic trigonometric functions. Most topics include solving and graphing equations. Students will learn by using online texts and videos. Students will do daily problem solving including SAT prep questions. Grading will be based on quizzes, tests and a final exam. This course comes from Algebra 2 Online! and Intermediate Algebra; it also uses Math is Fun, Yay Math! and Khan Academy. You will sometimes need graph paper. I will not put this in later for you to print out. Print some out before you begin the course to have on hand. You are allowed to use a calculator during this course. Do not use programs that solve the problems for you. There is no point to using those when you are just learning. You won’t learn how to solve the problems if someone is doing it for you. The calculator is for calculations. You already are great at multiplying and dividing and don’t need to spend time working out answers to those types of things. You can even use a calculator on tests. Cheating is a form of lying, and like lies, it eventually catches up to you. Things that say “presentation” are Shockwave Flash files. You will need it installed/updated/enabled in order to view them. If you are using an IPad or other tablet, make sure you are using an app or browser that will allow you to view them. A few times Java is also used. (*)Print out your grading sheet or use the Excel version. Complete the warm up problems. Record up to 3 points for at least three correct answers. Review order of operations when evaluating expressions. Click on the two video examples on expressions, simplifying and evaluating. Pause the video and try the examples yourself. Then watch to check your answers. Take the quiz on expressions. These types of quizzes are really like your homework. If you need to go back and look at the lesson, it’s okay to do that. It’s not cheating. Do the warm up problems. Review the properties of numbers. Watch the video on the types of numbers. Here is a page reminder of rational and irrational numbers. Read about the parts of the graph and answer questions one through five. Find the mean, median, mode, and range of 13, 25, 7, 28, 42, 7, 15, 23, 1, 17. Try solving equations. Do the first seven. Check your answers and go over the solutions to any you got wrong. Do you remember that absolute value is always positive. Use the link for a quick review. Watch the video and use the worksheet to take notes on absolute value equations. Read about solving absolute value equations. Read about graphing absolute value equations. Play with the graph on the page and make observations. Type in abs(x) or some other function with absolute value. Change the values by using the sliders. How does the graph change? How does it stay the same? Solve the absolute value equations. Check your answers and review the solutions of any you got wrong. Record your score out of 5 (potential for extra credit). Do the warm up problems on solving absolute value equations. Go over the two examples of solving inequalities with and / or. Take the quiz on solving inequalities. (Just a reminder that all of these types of “quizzes” you can use your notes while you take them. This is like homework or an in-class assignment.) In number three it uses the symbol for infinity, it looks like a sideways 8. Do the warm up problems on solving inequalities. Read about solving absolute value inequalities. Go over the example problem of solving absolute value inequalities. Record your score out of 6 (potential for extra credit). Do these exercises for review. (*)Take the short test. When you take a test, you have to close your notebook and all of your tabs/windows on your computer. ALWAYS hold onto your written tests. You can use these for review later. Do the warm up problems on solving absolute value inequalities. Go through the video and try the examples to find the domain and range. Read about functions and relations. Try the example with using the vertical line test. Try the example with finding the domain and range. Use graphs to find the domain and range. Record 5 points for completing #8 (first 4 correct or 5 correct in a row). Do the warm up problems on domain and range. Read about linear equations (or the equation of a straight line). You don’t need to use the links on the page. Do questions one through five. Record up to 5 points for your correct answers. Play more with making a graph from an equation. Make the graphs of the example equations by clicking and dragging the points on the graph. Record 5 points for making each of the five equations. Take off a point for any you couldn’t make. Go through this video presentation on linear equations. *Print out this worksheet to use to take notes as you watch the video on slope. Watch the video presentation on linear functions. Read about making a T chart. Read through the lesson on slope and y-intercept in word problems. Do the quiz on linear equations. Do the warm up problems on linear equations. Read about the other form of writing the equation of a straight line, point-slope form. Try the examples of writing equations in point-slope form. Try this example as well. Do the warm up problems on slope. Take the linear equation test. Play with the applet on finding parallel and perpendicular lines. Do these examples of finding parallel and perpendicular lines. Take the writing linear equations quiz. Record your score out of 7 (potential for extra credit). Do the presentation on functions (or read the topic text). Then do the practice and review. Record your review score out of 6. Do the warm up, presentation or topic text, practice and review on evaluating functions. You shouldn’t need the worked examples, but use them if you do. Record your review score out of 2. Do the presentation or topic text, worked examples as necessary, practice and review on finding domain and range. Do the warm up problems on writing linear equations. Learn about scatter plots and answer the questions. Record up to 5 points for at least five correct answers. Watch the video on graphs of absolute value functions. Make the graphs at :45 and 1:36 and then watch further to check your answers. Go through the example of graphing absolute value functions. Get five absolute value graphs correct. Learn about the greatest integer function, step functions and floor and ceiling functions. How are they all related? Read about floor and ceiling functions and answer the questions. These are types of step functions. An identity function returns the value inputted, so if you put in 1 for x, y is 1. If you put in -5 for x, then y is -5. The graph of an identity function looks like this. A piecewise function has a graph that is broken in pieces. It looks like this. A constant function returns the same number for y no matter what x you put in. What would its graph look like? Try the example of graphing linear inequalities. Here are some more examples to try. Take the linear inequalities quiz. Do these problems for review. Your test on Day 26 will only cover these items. A cumulative test will come later. Continue to review with these problems. ALWAYS hold onto your written quizzes. You can use these for review later. Do the warm up problems on graphing linear inequalities. *Print out the worksheet to take notes while you watch the video on solving systems of equations using graphing. Go through the video presentation on solving systems of equations graphically. Work through the examples. If you want a more detailed lesson, here is one. Try this example of solving a system of equations graphically. Try it first. *Print out the worksheet to take notes while you watch. Watch the video on solving systems of equations using the elimination method. Do the warm up problems on graphing systems of equations. Scroll down to the section on “Solving by Substitution.” Read that section and work through the examples. Here’s another lesson on solving by substitution. Write an algebraic expression to solve the pencil and jar puzzle. Answer questions 1-8 at the bottom of the page. Watch this lesson on classifying systems of equations. Solve these systems of equations. Record your score out of 4, one point for the graph and one point for the answer. Do the warm up problems on solving systems of equations algebraically. Watch this lesson on evaluating a determinant. Go through this lesson on Determinants and Cramer’s Rule. Try the quiz on Cramer’s Rule. slope-intercept At least do the middle column of finding the intercept. write the line equation There are 2 levels. Plot two points to graph the line. Can you write a system of equations to figure these puzzles out? Do the warm up problems on Cramer’s Rule. A little review of graphing inequalities and then we’ll look at systems of inequalities. Work through this example of solving systems of inequalities with graphs. Do the warm up problems on solving inequalities graphically. Watch the video on absolute value inequalities. Try these two problems. Pause the video, copy down the problem, solve it and then watch the solution. Watch the video on graphing absolute value. Watch the video on graphing absolute value equations. Watch the video on graphing systems of inequalities. Watch the video example of graphing systems of inequalities with no solution. Do the practice on graphing systems of inequalities. Record your score out of 13. If you got them all right, score 13. Score 12 for 1 wrong. Score 11 for 2 wrong. Score 10 for finishing the activity. Click on each type of transformation in the list (translation, reflections, dilation, rotation). Read the lesson and then try the practice examples. Use graph paper and then check your answers. Read this lesson on translations with matrices. Try some example problems. Pause and try what you can before you view the solutions. I took a course in college that used linear programming. We solved systems of equations in order to figure out where companies should distribution centers, how many employees a company should have, etc. We wrote as many equations as we could to put in as much information into the decision as possible and solved. These are the constraints, the limitations our decision was bound by. (The company will only spend a certain maximum amount of money on each employee, or only wants so many trucks in operation, etc.) You’ll be doing a smaller version of that today. Go through these examples of linear programming. Try this example problem in linear programming. Do the warm up problems on linear programming. Go through the example on this presentation of linear programming used to solve problems. Go through one more example problem. Record the score out of 5. Do the warm up problems on linear programming problems. *Print out this worksheet to take notes as you watch the video below. Watch the video lesson on solving systems of equations with three variables. Do the three video lesson examples on solving equations with three variables. Click on each one. They will open in new windows. Scroll down the page and learn about solving systems of equations with three variables. Do questions 9 and 10 at the bottom of the page. Do one of these problems (without looking at your notes). Check your answers (using your notes from the video on Day 43) when you are done. Use these problems to review for a test on Day 46. Continue your review by solving these linear programming word problems. *Print out this worksheet to take notes on as you watch the video below. Watch this presentation on identifying elements in a matrix. Find the determinant of the matrices. Do page one of this worksheet packet on matrices. Write in definitions of the bold faced words. (Search online if necessary, but you can probably just use your brain! Write the dimensions of the example matrices and do the problem at the bottom of the page. Hold onto your written work for your portfolio. Figure out your grade for the first quarter. Watch all of the tutoring sessions on adding matrices. Practice adding and subtracting matrices. Watch all the tutoring sessions on multiplying matrices. Watch the lesson on solving an equation containing a matrix. Do pages two and three of the matrix worksheet packet. Go through these pages on solving determinants. Do pages four and five of the matrix worksheet packet. Do the numbered problems (nine of them). Do you remember Cramer’s Rule? Watch the video lesson on finding the inverse of a matrix. Learn about the inverse and identity of a matrix. Try the questions at the bottom of the page. Do pages six and seven of the matrix worksheet packet. Do the example problems (five of them). Take the quiz on determinants. Take the quiz on the inverse of a matrix. Do one more quiz on the inverse. Watch the three video lesson examples of using matrices to solve systems of equations. Add a point. Record your score out of 4. Apply Cramer’s Rule to three equations. Learn about augmented matrices and using elementary row operations to find the inverse of a matrix. Read and answer the questions at the bottom of the page. Record 3 points for completion. Watch the lesson on writing systems from augmented matrices. Try the examples. Watch the lesson on using an augmented matrix. Take the quiz on using augmented matrices. Learn about box and whisker plots. Try the example and then watch the solution. Read the page on exponent properties. Answer questions 1-10. Use the page as necessary to remind yourself of the rules. You can do any of the “hard” problems for extra credit points if you get them right. Read about simplifying expressions with exponents. Answer the questions for practice. Watch the lesson on classifying polynomials. Watch the lesson on modeling data. Record up to 5 points for a correct graph. Read about adding and subtracting polynomials. Simplify the expressions. Do numbers 1, 2, 4, and 5. Answer the questions 1 through 10. Add an extra credit point if you can get this one. Take the polynomials quiz and record your score out of 5. Read about polynomial long multiplication. Answer questions one through ten. *Print out this worksheet to take notes while you watch the video. Watch the video on dividing polynomials with long division. Record your score out of 6. Record eight if you have a six because that means you either knew your stuff or you didn’t give up and kept trying. Watch the five lessons on factoring trinomials. Remember to pause and try things first when you can. *Print this worksheet to take notes as you watch the video. Do the warm up, presentation, worked examples (as necessary) and practice on the introduction to rational expressions. Record your score out of 5 for the practice. Do the warm up, presentation, worked examples (as necessary) and practice on multiplying and dividing rational expressions. Do the review from Day 71’s topic. Do the warm up, presentation, worked examples (as necessary) and practice on adding and subtracting rational expressions. Do the review from Day 72’s topic. Do the warm up, presentation, worked examples (as necessary) and practice on complex rational expressions. Do the review from Day 73’s topic. Do the warm up, presentation, worked examples (as necessary) and practice on solving rational equations and applications. Do the review from Day 74’s topic. Do the warm up, presentation, worked examples (as necessary) and practice on rational formulas. Do the review from Day 75’s topic. Do the tutoring session on profits and the rising cost of fuel. Read the lesson and answer the questions on rational expressions. Read the page and answer the questions on using rational expressions. Do the warm up, presentation, worked examples (as necessary) and practice on roots. Do the review section from roots. Do the warm up, presentation, worked examples (as necessary) and practice on multiplying and dividing radical expressions. Do the review section from Day 80. Do the warm up, presentation, worked examples (as necessary) and practice on adding and subtracting radicals. Do the review section from Day 81. Do the warm up, presentation, worked examples (as necessary) and practice on multiplying multiple term radicals. Do the review section from Day 82. Do the warm up, presentation, worked examples (as necessary) and practice on rationalizing denominators. Do the review section from Day 83. Do the warm up, presentation, worked examples (as necessary) and practice on solving radical equations. Do the review section from Day 84. Do the warm up, presentation, worked examples (as necessary) and practice on complex numbers. Do the review section from Day 85. Do the warm up, presentation, worked examples (as necessary) and practice on operations on complex numbers. Do the review section from Day 86. Do the warm up, presentation, worked examples (as necessary) and practice on operations on square roots and completing the square. Do the review section from Day 87. Do the warm up, presentation, worked examples (as necessary) and practice on operations on the quadratic formula. Do the review section from Day 88. Complete these exercises to review. radical expressions Record your score out of 10. This is the end of the quarter. Figure your final grade. Make sure you save your written work. You can also print a screen shot of the sites we are using. How is your grade? What can you do to improve it? Complete these exercises for review. (*) Take your test. Do not use notes. Try some review problems. Do a few from each set. Watch the video on graphing quadratic functions. Take notes. Do the two problems on this worksheet without using your notes. Check your notes to see if you did it right. Correct any problems. Complete the lesson on Multiplying Binomials. Complete practice problems to check your understanding. If you aren’t getting this easily, then try some more by using the worksheet. Complete the challenge question at the bottom of the page. (*)Print out this worksheet to use to take notes while you watch the video. Watch the video lesson solving quadratic functions. Complete the lesson on solving quadratic equations by factoring. You have to create a free account. We will be using this again, so please do. Make sure to complete the practice problems to check your understanding. Here’s a review of solving quadratic equations by factoring. Complete the lesson on solving quadratic equations using square roots. Make sure you do practice problems to check your understanding. Complete the lesson on solving quadratic equations by completing the square. Complete the lesson on using the quadratic formula to solve quadratic equations. Make sure you do some practice problems to check your understanding. Review solving quadratics with graphing and take the quiz. Review solving quadratics by factoring. Answer questions 4, 5, 6, 9, and 10.
Review about solving quadratics by completing the square. Record you score out of 5.
Review about solving quadratic equations. Solve these quadratic word problems. Try them first and then look through the solutions. There are just the problems on the page. There are no extra questions at the end. *Print out this worksheet to take notes as you watch the video. Watch the video on complex numbers. Go through this page on the relationship between the discriminant and the graph of the quadratic equation. Use the video lessons on the quadratic formula and the discriminant. Use the video lesson on solving quadratic equations using the quadratic formula, complex solution. Do the warm up on the quadratic formula and discriminant. Record up to three points for up to three correct answers. Take the quiz on the sum and product of roots. Do the warm up on the sum and product of roots. Take the quiz on graphing parabolas. Use the lessons if necessary. Read the lesson on graphing quadratic inequalities and try the practice problem. Take the quiz on graphing quadratic inequalities. Use the following exercises to review for a quiz. Continue your review with this exercise on graphing quadratic inequalities. Watch the video lesson on the distance formula. Do questions one through five at the bottom of the page. Use the lesson on the page as necessary. Read the lesson on the midpoint formula. Find the midpoint. Answer questions one through seven. Use the distance and midpoint formulas to complete these exercises. (*)Use this worksheet to take notes while you watch the video. Watch the video lesson on conic sections with parabolas. (*)Use this worksheet to take notes as you watch the video. Watch the video lesson on conic sections and circles. Read the lesson on the equation of a circle and answer the questions. You may use your notes for these. Take the quiz on circles. Watch the video lesson on conic sections with ellipses. 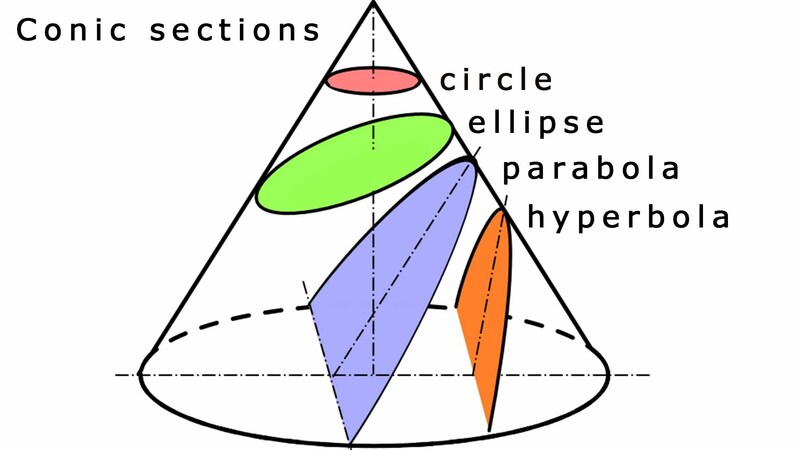 Watch the video lesson on conic sections with hyperbola. Take the quiz on ellipses. Take the quiz on hyperbola. Watch the video lesson on identifying conics. Review solving systems of equations algebraically. Solve the systems of equations. Review all of your written quizzes. We are going to be focusing again on functions. This is part review and then we will be looking at polynomial functions. Review functions with this lesson. Do this lesson on operations on functions. Answer the questions at the bottom of the page. The “hard” questions are extra credit. Use the lesson links to learn about the composition of functions. Practice by completing all parts of numbers 1-3. Score up to three points for problems two and three and up to four for the first problem. Complete the practice on the composition of functions, completing all parts from questions 4-10. NOTE! Don’t worry about the sine, cosine, tangent words. That’s trigonometry. Watch the video lesson on polynomial functions. Take the quiz on polynomial functions. Figure out your third quarter grade. Hold onto your written work. You can use screen shots to show the websites you are using as well. How is your grade? How can you improve it? Watch the presentation on increasing and decreasing functions. Answer the practice questions before you look at the answers! Learn about vertical and horizontal asymptotes. Take the quiz and record your score out of 5. Learn about the remainder and factor theorems and answer the first five questions. Learn about the fundamental theorem of algebra and answer the first five questions. Record your score out of 5. Take one point off (of 5) for any incorrect answers. Read through the lesson on roots and zeros of polynomials. Go through the video lesson on the root theorem. Go through the video lesson on solving equations with the root theorem. Go through the video lesson on the irrational root theorem. Go through the video lesson on finding the imaginary root. Go through the video lesson on writing a polynomial from its roots. Take the roots and zeros quiz. Do you need a reminder from the lesson on roots and zeros. Read about solving polynomials and answer the first five questions. Go through the example of solving polynomials by graphing. Go through the example of solving polynomials by factoring and the quadratic formula. Go through the example of solving polynomials of higher degrees by factoring. Take this review quiz and record your score out of 5. Read the lesson on factorials. Answer the first three questions at the bottom of the page. (*)Print this worksheet to take notes on while you watch the video. Watch the video on permutations. (*)Use this worksheet to take notes on while you watch the video. Watch the video on combinations. Read about the Binomial Theorem. Answer the questions. Do numbers 1-7. You can do numbers 8-10 as extra credit problems. Read about Euler’s number and answer the three questions on the bottom of the page. Give yourself an extra credit point if you can say the first 16 digits of Euler’s number. Review permutations and answer the four exercises. Review combinations and answer the three parts to Example 5. Read about finding a pattern in a sequence. Answer questions 1-5 at the bottom of the page. Answer questions 1-7 at the bottom of the page. Record your score out 7. Read about the Fibonacci Sequence. Read this introduction to logarithms or choose the top video from the left sidebar. Watch the video tutorial on arithmetic sequences. Take the quiz on arithmetic sequences. Watch the video tutorial on geometric sequences. Take the quiz on geometric sequences. Do these word problems involving arithmetic and geometric sequences and series. You can refer to these review lessons if necessary. Practice with the binomial theorem. Refer to the review lesson if necessary. Do the warm up, presentation (or text), worked examples (as necessary) and practice on exponential functions. Do the review from exponential functions. Do the warm up, presentation, worked examples (as necessary) and practice on logarithmic functions. Your final exam does not include logarithms. Do the review from logarithmic functions. Do the warm up, presentation, worked examples (as necessary) and practice on properties of logarithmic functions. Do the review from properties of logarithmic functions. Do the warm up, presentation, worked examples (as necessary) and practice on natural and common logarithms. Do the review from natural and common logarithms. Do the warm up, presentation, worked examples (as necessary) and practice on solving exponential and logarithmic equations. Do the review from solving exponential and logarithmic equations. Do the warm up, presentation, worked examples (as necessary) and practice on mathematical modeling with logarithmic functions. Do the review from mathematical modeling. Do the warm up, presentation, worked examples (as necessary) and practice on identifying the six trigonometric functions. Do the review from identifying the trigonometric functions. Do the warm up, presentation, worked examples (as necessary) and practice on right triangle trigonometry. Do the review from right triangle trigonometry. Do the warm up, presentation, worked examples (as necessary) and practice on unit circle trigonometry. Do the review from unit circle trigonometry. Do the warm up, presentation, worked examples (as necessary) and practice on degree and radian measure. Do the review from degree and radian measure. Do the warm up, presentation, worked examples (as necessary) and practice on graphing the sine and cosine functions. Do the review from graphing the sine and cosine functions. Do the warm up, presentation, worked examples (as necessary) and practice on amplitude and period. Do the review from amplitude and period. Logarithms are not on your final exam. One last topic. We’re going to review our data analysis and look at couple new things related to it. Read about standard deviation and variance and answer the questions. Read about calculating z scores. Watch the video on finding z scores. Take the quiz on standard deviation and z scores. Use this test for review. This is a good example of the types of problems that will be on your final. Take note of what things you can’t remember. You will have your final exam on Day 180. In the test it says, “feasible region,” which I didn’t remember from the course (maybe you recognize it). It’s not something new. Here’s one explanation I found online. “Draw all of your lines. According to the inequality, shade above or below for every line. The feasible region, or solution region is a shared region that all of the lines have in common.” The apparent solution set is just what appears to be the solution set. Study for your final exam on Day 180. Review topics that you jotted down yesterday as things you forgot. You need to know what the graphs of absolute value equations and inequalities looks like as well as the graphs of different types of functions (or be able to figure out what they look like). Do you remember the types of conic sections? You need to know what arithmetic and geometric sequences are. Can you multiply matrices? Relax when you take your exam. If things are worded a little differently than you are used to, don’t flip out! Use your brain and use what you know to answer the question. You know this stuff. You can do it! (And I will give a little leeway in grading since you were not “taught to the test” as other students would have been. I’m not sure this course covers enough trigonometry for the College Algebra CLEP test. Trigonometry and Pre-Calculus is the next course in the math progression. Here’s a CLEP College Mathematics practice test.